This was to be my final Suffolk Catholic church, but the problem was we couldn't find it. I had left the Diocesan directory at home, so we resorted to driving around Brandon hunting down every small cross marked on the Ordnance Survey map. We had already photographed the outside of the medieval parish church of St Peter, which is marooned in a housing estate on the west side of town, and would need to go back to do the inside when the keyholder was available that afternoon. Already we had driven back and forth through Brandon visiting village churches either side, and now it appeared that we would never escape the place. And then something rather remarkable happened. There was only one cross left to find, and I knew it would be the Catholic church. I had suddenly remembered the address, and it included the name of the village on that side of town. We headed up the high street, over the river bridge and railway line, and passed a sign that told me something I should have spotted from the map. Something I didn't want to know. It said Welcome to Norfolk. My usual response to signs like this is to say "you certainly are" or something equally witty, but I was struck with horror. Did this mean that St Thomas of Canterbury was not my last Suffolk Catholic church - indeed, was not a Suffolk church at all? I turned to DD. "It's in Norfolk", I said. "Yes", he said. We arrived at the church. I thought we should go ahead and behave as normal - after all, I could always decide later what to do about it. "If you don't tell anyone, I won't", I said. The church was open, and my first thought was how much the entrance area was like that of the sister church at Mildenhall. Stepping into the body of the church, however, it was rather different. Where Mildenhall is almost square, this church is long and narrow. It had the feel of a much older church, its traditional layout not paying too much homage to Vatican II, but was light and airy, with a modern altar. A nice touch is the icon in the corner to Our Lady of Czestachowa, provided by the Polish community who use this church each Sunday. 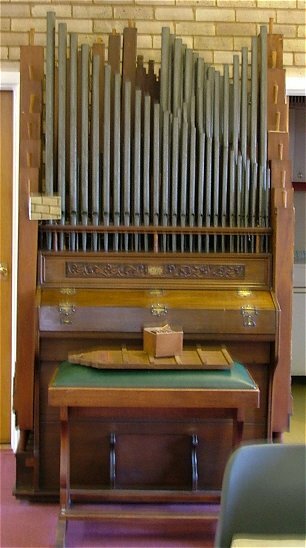 A little pipe organ sits at the west end. The nice man tidying the sacristy told us that he thought it came from a London catholic church originally. 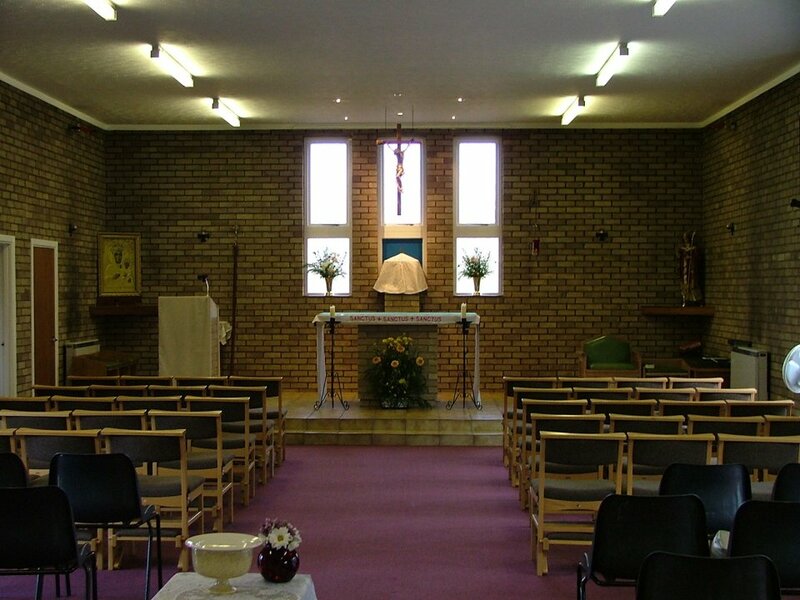 He also confirmed that the church is in Norfolk, and is actually in the civil parish of Weeting. I pretended not to hear. 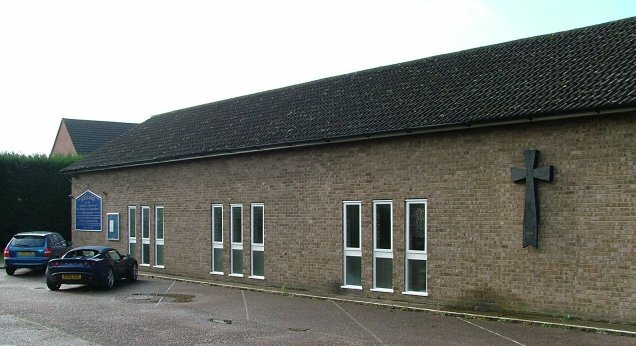 St Thomas of Canterbury was built in 1976, replacing a wooden church that had stood on the site since 1923. Its consecration was one of the first acts of the first Bishop of East Anglia, Alan Clark; before then, Brandon had been in the Diocese of Northampton. The building cost £25,000, partly funded by a bequest. I pottered about taking photos, while DD glumly examined the noticeboard. "They seem to have hidden all their medieval things away" he observed on leaving, at which I reminded him that all their medieval things were now in the possession of the Church of England, and were locked up in the middle of a housing estate on the other side of Brandon.